Going into Spring Training for the San Francisco Giants, there were about four or five open spots on their 25-man roster. The position battles that have to be worked out in Spring Training are for two, possibly three, spots in the bullpen, a backup infielder spot, and a fifth outfielder spot. 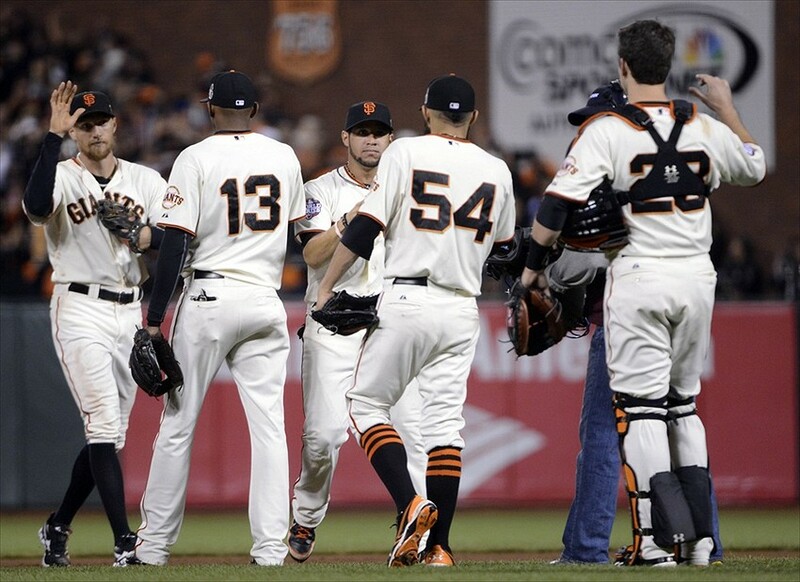 The San Francisco Giants were officially eliminated from the NL West Monday night. The Giants won’t be winning a wild-card playoff spot either, so it’s officially time for the organization to start looking towards the future. 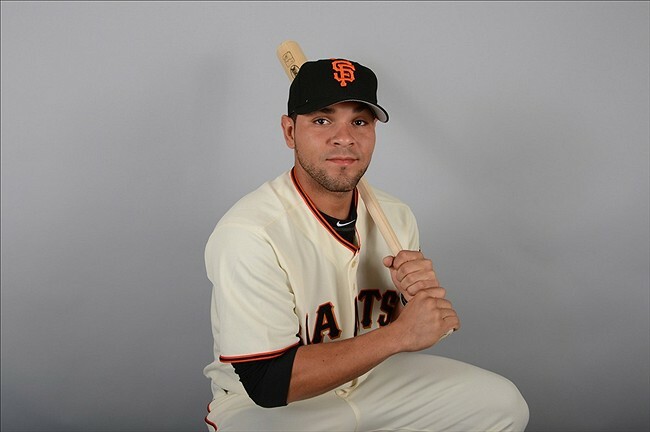 The Giants called up many young, promising players from their AAA affiliate, the Fresno Grizzlies, at the beginning of this month. They brought back some familiar faces such as Jake Dunning, George Kontos, Francisco Peguero, Nick Noonan, and Juan Perez. They also brought up some prospects that hadn’t made their major league debuts yet such as Johnny Monell, Ehire Adrianza, and Heath Hembree. Since the September call-ups, not many of these prospects have started games or seen a significant amount of playing time though. Bruce Bochy seems adamant about starting his regular players for the rest of the season. Bochy’s stance is understandable. After an extremely disappointing season, Bochy wants this team to finish this season strong. Even if it’s impossible to make the playoffs, they could still finish off the season on a run and carry some of that momentum into next season. If they finish on a good note, then it’s more likely that the returning Giants players will come into spring training with a better attitude and will be more focused on getting back to the playoffs next season. Although that argument verifies that Bochy should continue to start the regular players, it’s time to at least start mixing in some of the prospects. Bochy doesn’t necessarily have to do a starting lineup with just the prospects, but it would be wise to give each of them some starts occasionally. This will give them some experience in the major leagues, it will make them more confident about their game, and it will potentially put some of them in a better position to make next season’s roster. For example, Hembree has a great shot at making an impact next season for the Giants. In fact, Hembree almost made the 25-man roster coming into this season. He has only appeared in three games so far this season for the Giants, but he has been very impressive so far. He currently has a 0.00 ERA with three strikeouts and two walks in three innings. He also has only allowed one hit. He has shown great command of all his pitches, and he throws hard. 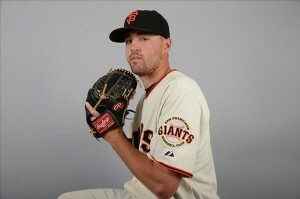 He could easily make the 25-man roster next season and be one of a couple right-handed set-up men for Sergio Romo. After gaining some more experience in Fresno this year, he looks like he’d be ready to contribute effectively next season. Although he most likely won’t make next season’s roster, it would be interesting to see Monell get some starts too. Since Buster Posey is still playing with a small fracture in his right ring finger, it’d make sense for the Giants to rest him more or at least give him a break from catching. Hector Sanchez will certainly get a fair number of starts at catcher for the rest of the season, but Monell could really use some more experience behind the plate. Monell has great power, but he needs to work on his defense. Giving him a few starts would be a great opportunity to see what he can do and what he can work on. Adrianza is another prospect that should get a few starts. Adrianza is known for his defense at shortstop, but he started to improve on his offense once he was promoted to the Grizzlies earlier this season. The Giants should give him a couple spot starts to see if he truly has become more proficient with the bat. The Giants, for the most part, already know what they’ll get out of Dunning, Kontos, Peguero, Noonan, and Perez. Dunning and Kontos will definitely get some consistent playing time out out of the bullpen, since Bochy wants to utilize his larger staff of relief pitchers. Perez and Peguero will most likely get some spot starts in left field, and it’s not clear how much playing time Noonan will get, besides pinch-hit opportunities. The 2013 season for the Giants is almost over, but it’s not too late to give their prospects a chance to prove why they deserve to make next season’s roster. It’s time to focus on 2014 and which prospects could make an impact. San Francisco Giants: Should They Call Up Gary Brown and Heath Hembree? 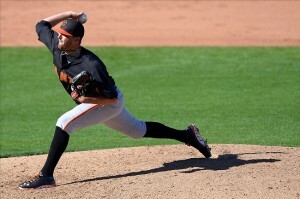 The San Francisco Giants are starting to focus on the future. They currently have a 52-65 record, are 15.5 games back from the Los Angeles Dodgers, and are in last place in the NL West. Based on their disappointing season, Brian Sabean and Bruce Bochy will perhaps decide soon to play their regular players less and call up more players from AAA, such as Gary Brown and Heath Hembree, to see who could possibly contribute to the team during the 2014 season. However, the Giants are not in complete rebuild mode, since they already have several valuable pieces on their roster who can contribute next season. The Giants have to finish this year strong. If they completely give up now, they will have no momentum whatsoever going into the offseason and going into next season. Also, Sabean wants to be cautious with rushing players’ development. He said recently that the Giants might have rushed Brandon Belt and Brandon Crawford too quickly throughout the minor leagues. He said this might be the reason why they have taken more time to develop as hitters. Because of this, it seems rather unlikely that Sabean will call up Brown or Hembree soon. 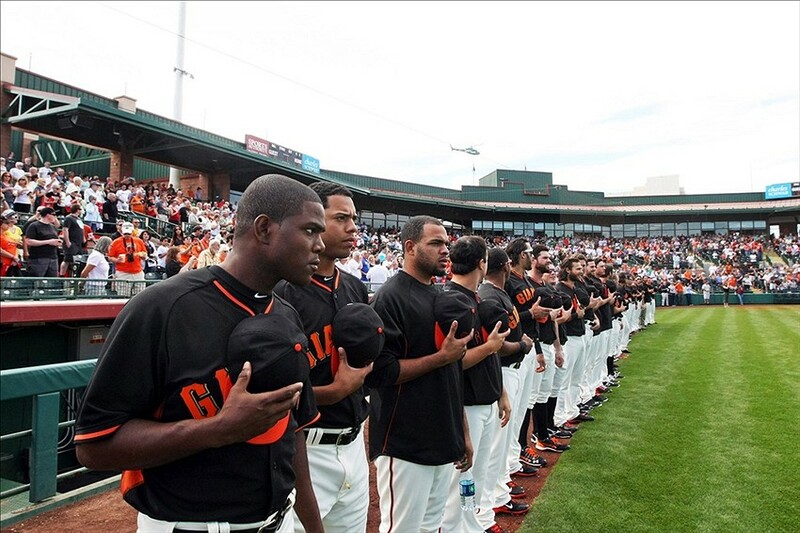 When the rosters expand in September, the Giants could easily decide to call them up. For now though, the Giants want to stick to the group that they have, especially because their current roster is very similar to the roster that won the World Series last year. 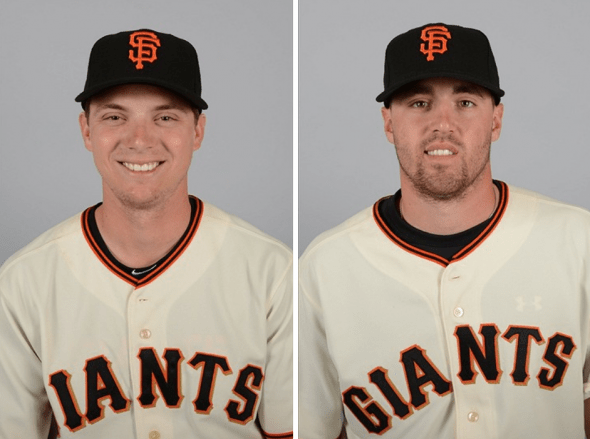 Besides getting a closer look at some of their prospects, the Giants don’t have a lot of reason to call up Brown and Hembree now based on their performances this year. Brown has had a disappointing 2013 season. The center fielder currently has a .228 average, 12 home runs, 46 RBI’s, a .286 OBP, and a .384 slugging percentage. He also has 13 stolen bases, but he’s been caught 10 times. Brown had a promising year in Richmond in 2012 when he hit .279, had a .347 OBP, and had 33 stolen bases. After such a strong year, the Giants have certainly been tracking his progress this year in AAA to see if he should be called up. However, Brown started off the 2013 season struggling, as he hit .180 in April and .248 in May. After a promising June when he hit .278, Brown has continued to struggle, as he hit .233 in July and .128 in August. The Giants are in dire need of some help in the outfield and the leadoff spot, but Brown is not the answer, right now at least. He has a low OBP this year, and he hasn’t had success stealing bases. They could also use his right-handed bat off the bench to hit left-handed pitching, since Jeff Francoeur has not been productive and Joaquin Arias has been injured off and on this season. However, Brown has struggled against left-handed pitchers though, as he’s only hit .247 off them this season. He hasn’t hit right-handed pitchers well either, as he has hit .223 against them this season. The Giants have also struggled all season with clutch hitting, which hasn’t exactly been a strength of Brown’s this season either. He’s hit only .205 with runners in scoring position so far. As for Heath Hembree, he has had a fairly disappointing season in Fresno also. The right-hander currently has a 4.15 ERA with 26 saves in 47.2 innings pitched. He has struck out 58, but he has allowed 47 hits and given up 15 walks. Hembree got off to a hot start, as he had a 2.19 ERA and seven saves in 12 games in April. However, he had a dreadful May and June when he had a 5.73 ERA with six saves in 11 games and then a 7.84 ERA with only three saves in nine games. He has bounced back relatively well though. He had a 2.53 ERA in July with seven saves in 11 games, and, so far, he’s had a 0.00 ERA with three saves in four games in August. Hembree has been an intriguing prospect for the Giants. He’s shown that he’s a promising closer, but he still needs more time to develop. He has a 2.60 ERA against right-handers, but he has a 6.30 ERA against left-handers. He also has a 6.75 ERA with runners in scoring position, which is unacceptable for a closer. There is a strong possibility that when the rosters expand in September that Brown and Hembree could be called up. However, before then, it doesn’t make much sense for the Giants to rush their development. They’d much rather stick to the players that rode them to their second World Series title in three years, even if making the playoffs is impossible. The Giants are a loyal organization, and they want this group to finish out this season strong.